alaTest has collected and analyzed 11 reviews of Samsung N20-1018. The average rating for this product is 3.8/5, compared to an average rating of 4.6/5 for other products in the same category for all reviews. We analyzed user and expert ratings, product age and more factors. Compared to other products in the same category the Samsung N20-1018 is awarded an overall alaScore™ of 76/100 = Good quality. 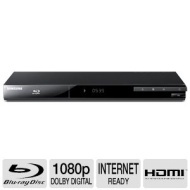 Great price, great blu-ray player. Got this player for a great price, $40 shipped after rebate.....Liked it so much I bought a second one, Samsung quality and internet-ready for a steal. Refurbished, item was flawless. Item works well right out of the box. Good clear picture, easy to use controls. A remote control Eject button would be a nice feature. The sound is always off by a little. You can reset it several times through a movie and make it work. I only used it once and packed it back up ony to find out there is NO REFUND. Purchased an earlier model, needed another. Price was better than the earlier model, better features. Would buy again. Not bad for a refurb. I needed something inexpensive for a second entertainment room and it works perfect. Needed something with the smart hub to stream from storage device as well as Netflix and Pandora. up and running in minutes,would give 5 stars for value but wi-fi antenna is sold seperate.updated no problem! !